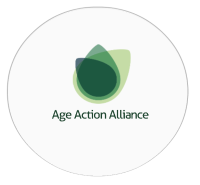 The Age Action Alliance was launched in 2011 in response to a growing recognition of the need to respond to an ageing society. In particular, to bring together older people and cross sector organisations to work together to celebrate the opportunities and address the challenges of our ageing demographics. Our vision is to improve the quality of later life through partnership working between members and older people; creating communities where older people feel secure, valued and able to contribute to society. Age Action Alliance is a network which brings together organisations and older people, in partnership. Drawn from civil society and the public and private sectors, it takes a positive approach to ageing and seeks practical ways to improve services and support to older people.